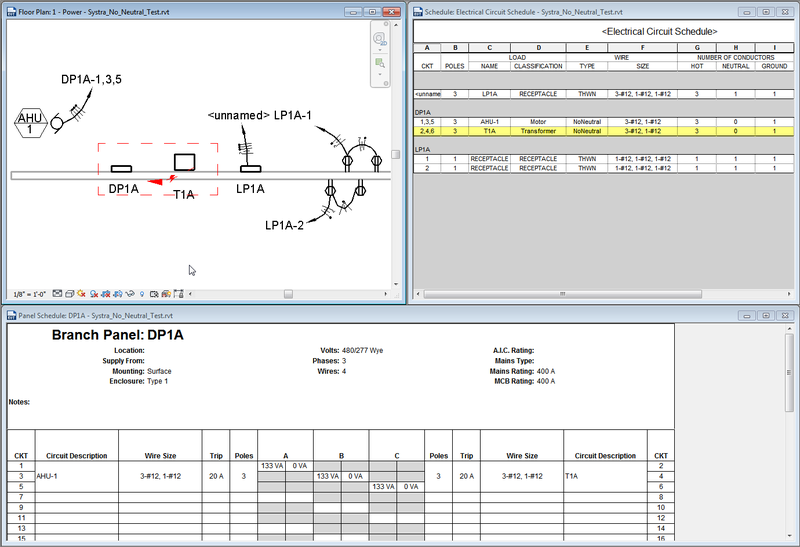 Recently, a customer came to us with an issue whereby they wanted to create a feeder circuit to the primary distribution (upstream) side of a Step-down Transformer without a neutral conductor. Revit, would keep putting one in. The image below indicates the issue at hand. 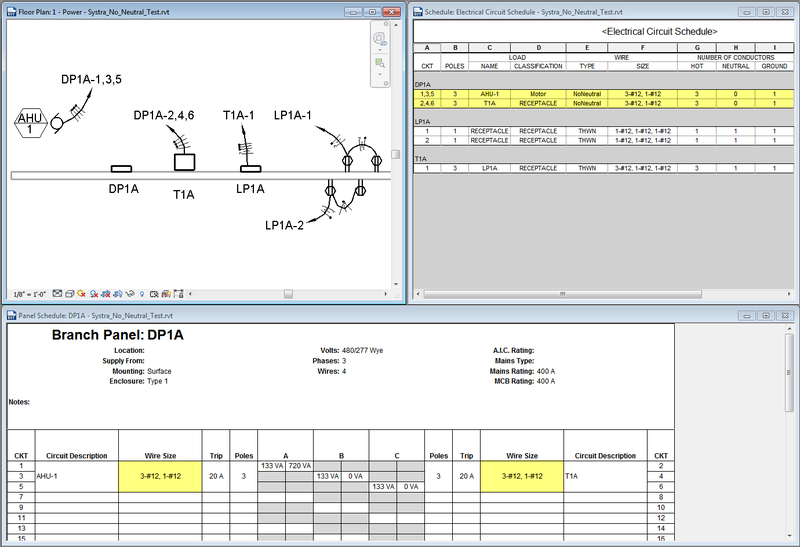 Revit power circuits must be assigned a Wire Type by the engineer when they are created. This is easily accomplished by editing the circuit through the use of the Properties Palette or a project schedule of Electrical Circuits. The default Wire Types provided out-of-the-box include hot, neutral, and ground conductors. 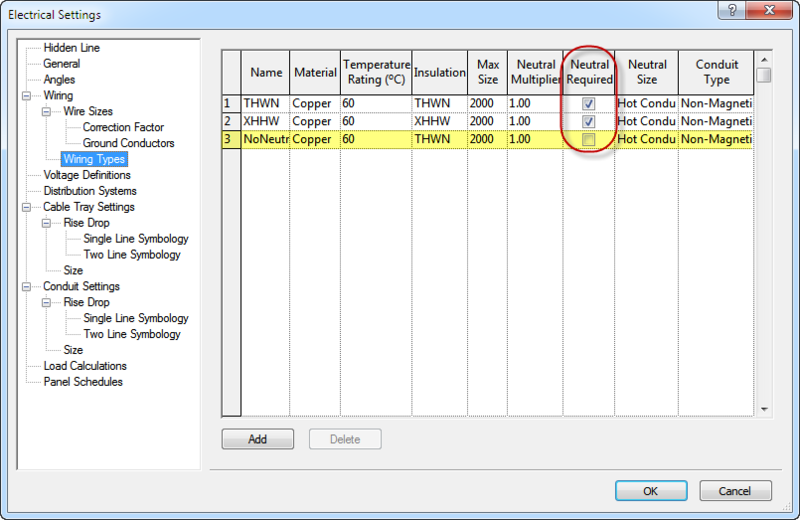 This is important when Revit performs the calculations to determine the Wire Size and number of conductors. Within the Electrical Settings (ES) are the Wiring settings which include the Wire Types. Here users can define the Wire Type’s name, material, temperature rating, insulation, conduit type, and neutral parameters. Below, I simply created a new Wire Type and toggled off the Neutral Required parameter. At this point, one would assume that you could just select the primary circuit from the transformer and switch Wire Types. Well, Revit doesn’t seem to want to let go of that neutral conductor. Let’s see what happened. The sequence of circuiting is critical to note here. On the left side of the plan view below, I’ve connected a motor load to the panel DP1A. It’s a 3 pole 480 balanced load. Using the circuit’s properties, I switched the Wire Type to the one that omits the neutral. Sure enough, the neutral is omitted. Now, let’s turn our attention to the right side of the plan. Here, I created two separate branch circuits of 1 pole 120 V receptacles to panel LP1A using a THWN wire type. Next, I circuited LP1A to the secondary on transformer T1A again using a THWN wire type. Finally, I circuited the primary on transformer T1A to the panel DP1A. Using the same logic as I did with the motor circuit, I edited the circuit’s properties to change the Wire Type to the one that omits the neutral. Reviewing the Electrical Circuit Schedule reveals that the neutral conductor is still there even though the Wire Type omits it. The Panel Schedule reveals the issue too. Multi-pole circuit 1,3,5 for the motor shows the desired results while multi-pole circuit 2,4,6 for the primary on the transformer does not. Here is the solution. As I mentioned, the sequencing is key here. The secondary on the transformer cannot be circuited first. Therefore, when you circuit the primary side of the transformer and change the Wire Type before you circuit the secondary, the neutral will remain omitted. In the image below, I rectified the issue by first disconnecting the panel LP1A from the secondary of transformer T1A. Then, I removed the cumbersome multi-pole circuit 2,4,6 between T1A and DP1A including its homerun wire and wire tag. 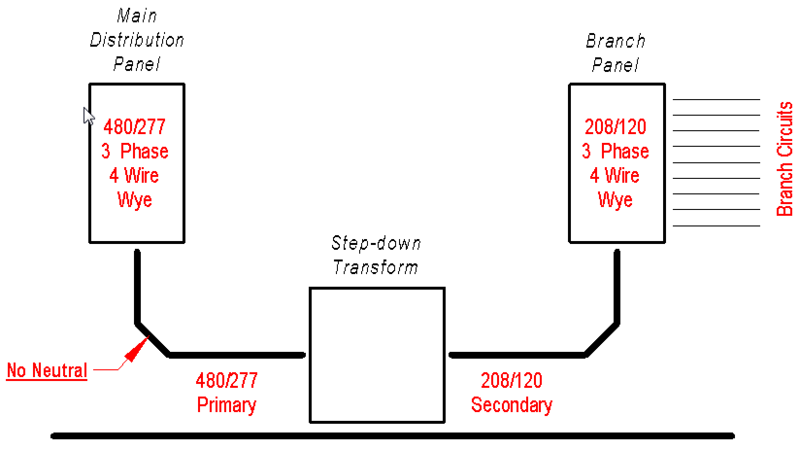 From here, I recreated the circuit between T1A’s primary and DP1A. Using the circuit’s properties, I changed the Wire Type to the one that omits the Neutral. Alas, I assigned the open LP1A circuit to the secondary of the transformer T1A. Recreated the homerun from the transformer and tagged it. Voila! Note the tick marks on the wire tell the tale too!